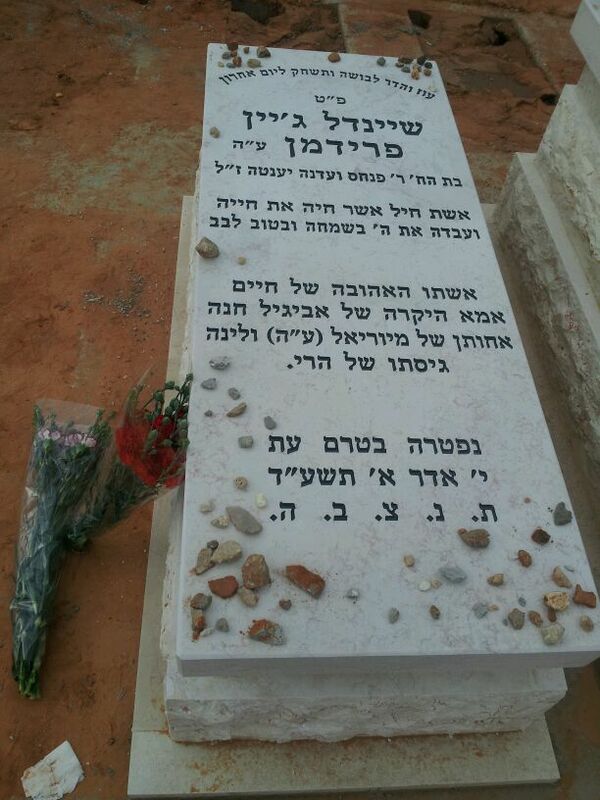 On the afternoon of ט’ אדר א תשע”ד, March 11th 2014, dozens of family and friends gathered round Jane’s kever in Petach Tikva’s Segula cemetery to mark the Shloshim since her petirah. Below is a picture of the matzeva. The beautiful and moving hespedim at the shloshim were given by Rav Moshe Lifshutz of Mekor Chaim shul, Yisrael Amitai (a cousin), and Peninah Rabin (a very good friend). Henry sang El Malei Rachamim. Here is a recording of the proceedings. Click on the blue arrow to listen. Meanwhile, during the month since Jane ע”ה passed away Chaim’s nephew David organized learning mishnayot of Seder Mo’ed לעילוי נשמתה which was gladly taken on by many friends and relations. He will be making a siyum in Australia. May Jane z”l be a מליצת יושר for all of us she left behind and for all of Am Yisrael, and may her soul reside in Heaven next to G-d’s throne. May we meet only in smachot from now on.